at Clermont Ferrand (63) to the Embraer 120 "Brasilia"
This report presents the technical conclusions reached by the BEA on the circumstances and causes of this incident. In accordance with Annex 13 of the Convention on International Civil Aviation, with EC directive 94/56 and with Law N° 99-243 of 30 March 1999, the analysis is intended neither to apportion blame, nor to assess individual or collective responsibility. The sole objective is to draw lessons from this occurrence which may help to prevent future accidents or incidents. Consequently, the use of this report for any purpose other than for the prevention of future accidents could lead to erroneous interpretations. This report has been translated and published by the BEA to make its reading easier for English-speaking people. As accurate as the translation may be, please refer to the original text in French. Scheduled public transport flight passenger Flight RGI 396 AK, from Clermont Ferrand to Pau. Around one minute after takeoff from runway 26 at Clermont Ferrand, the pilot felt a shock followed by strong vibrations on the controls. The crew decided to return to the airfield and requested priority and the callout of the emergency services. They were unable to determine the source of the problem but the vibrations slightly reduced in intensity with the reduction of speed on final approach, the extension of the landing gear and of the flaps. 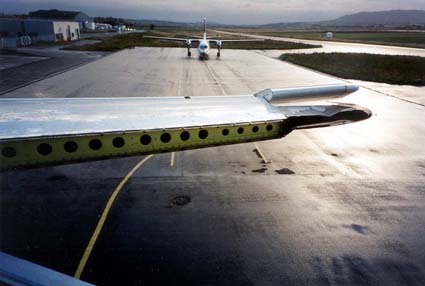 On the ground, the loss of the whole of the leading edge of the horizontal stabilizer was noted. Flight RGI 396 AK took off at 19 h 30 from runway 26 at Clermont Ferrand airport bound for Pau with twenty-six people on board. During a left turn towards Agen at around FL 140, the pilot flying (PF) felt a shock followed by strong vibrations. He informed the second pilot of this and they decided to return to the airport and land, requesting priority. Both pilots felt the same vibrations but were unable to identify the source of the problem. They flew downwind on the left hand side for runway 26, stopped climbing at 4 000 feet and remained in sight of the aerodrome. During this time, the control tower called out the emergency services. The vibrations slightly reduced in intensity with the reduction of speed on final approach, the extension of the landing gear and of the flaps. The aircraft landed at 19 h 38. 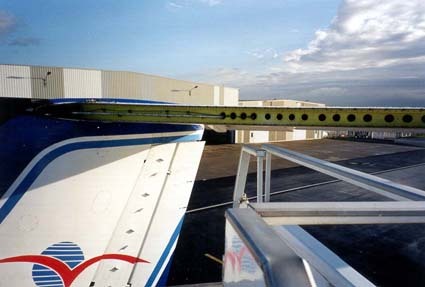 On the apron, the loss of the loss of the leading edge of the horizontal stabilizer was noted. Despite the searches which were undertaken, this part was never recovered. Male, 39 years old, employed by the company since 1995, Airline Transport Pilot'sLicense since 1998, type rating in 1998. License valid until 30 June 1999. He had made twenty-eight landings at Clermont-Ferrand in the previous 30 days. Male, 58 years old, employed by the company since 1994. Airline Transport Pilot'sLicense since 1971, type rating in 1997. License valid until 31 January 2000.
in the previous 30 days : 73 all on type. He had made twenty-six landings at Clermont-Ferrand in the previous 30 days. He was pilot flying at the time of the event. The aircraft received its French Certificate of Airworthiness on 13 March 1998 and its Certificate of Registration on 2 April 1998. It had previously belonged to Delta Air Transport (DAT) and registered on the Belgian Register under the registration OO-DTH. At the time of its transfer to Regional Airlines, it had just been through a 4C check and had a total of 11 828 flying hours. - Manufacturer : Empresa Brasileira de Aeronautica S.A., Brazil. - Type : EMB-120 ER Brasilia. - Serial number : 120-104. - Service entry date: December 1988. - Certificate of airworthiness : situation V, category N/TPP, issued 13 March 1998, expiry date 13 March 2001. - Flying hours : 12 570. - Number of cycles : 14 060. - Number of engines : 2. - Manufacturer : Pratt and Whitney, Canada. 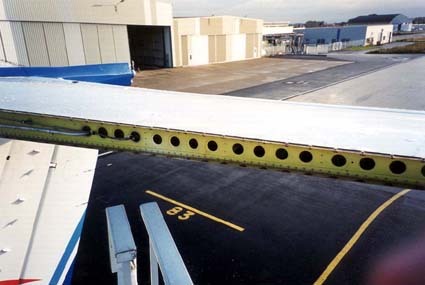 The horizontal stabilizer is 6,35 meters up and includes a right leading edge and a left leading edge, each fitted with a de-icing boot (see appendix 1). These parts, made of composite materials (glass fiber, kevlar, honeycomb) are attached to the horizontal stabilizer by screws (P/N PE 21101-3-2SD) held in place by retaining nuts (P/NMS 21059). The tightening torque recommended by the manufacturer, with reference to the MIL-DTL-25027 standard is between 2 and 18 lb.in. Each leading edge is held in place by forty-two screws on the upper surface, forty-two screws on the lower surface, six screws at the tip and six screws at the wing root. The rubber de-icing boot is glued onto the leading edge. Replacement of the de-icing boots requires removal of the leading edges. A check on the de-icing boots is included in the daily maintenance check. On 27 July 1998, Regional Airlines sent an order to Nantes Aero S.A.'s maintenance workshop for the replacement of de-icing boots on eight E-120's during a refurbishment of the fleet. F-GTSH was the fifth in the series. Work was spread over several days and was completed on 10 September 1998. The left de-icing boot of the horizontal stabilizer was replaced on 2 September. Nantes Aero S.A. told the investigators that at that time some of the screws had been replaced by screws from the manufacturer. Others, in good condition, had been kept. The team responsible for the work included four technicians. The team consisted of four very experienced men (with over fifteen years experience, replacing de-icing boots was hardly a novelty) who supervised four less-qualified men. The work was carried out following the Embraer 120 Maintenance Manual. The workshop has been JAR 145 approved since 28 December 1993. Approval for return to service was issued after an inspection of the work by a supervisor from outside the team, followed by a ground run to check de-icing boot function and by a check flight. Wind 210° / 4 to 6 kt, visibility over 10 km, clouds 1/8 Sc at 3 600 feet, 3/8 Sc at 5 600 feet, 7/8 Ac and As at 10 000 feet, temperature 16 °C, QNH 1004 hPa. The estimated wind above the airport at 2 000 feet was 180° to 200° at 14 to 18 kt. The crew was in contact with Clermont Ground and Tower on 118,625 MHz. The communications were recorded (see appendix 2). The main point of interest is that, after the vent, the crew informed the tower of their intention to return and land, without specifying the nature of the problem. They requested priority on landing, stated that they were in sight of the field and gave their position. At the suggestion of the controller, they requested the callout of the emergency services. The tower confirmed permission to land and asked the crew about the nature of the problem so as to be able to inform the safety vehicles. The crew spoke of a shock and vibrations in the controls. The landing was uneventful. The rest of the conversation is a dialogue between the tower and the emergency services. Clermont Ferrand aerodrome is controlled and open to public air traffic. It is 7 km east of Clermont Ferrand at an average altitude of 333 meters. It has a hard runway oriented 08/26 which is 3 015 long and 45 meters wide, equipped with an ILS at QFU 26. The Fairchild Flight data Recorder (FDR), P/N 17M800-261, S/N 3878 and the Fairchild Cockpit Voice recorder (CVR), P/N 93-A100-83, S/N 53589 were read out and analyzed at the B.E.A. The work on the FDR showed that the flight parameters remained normal. 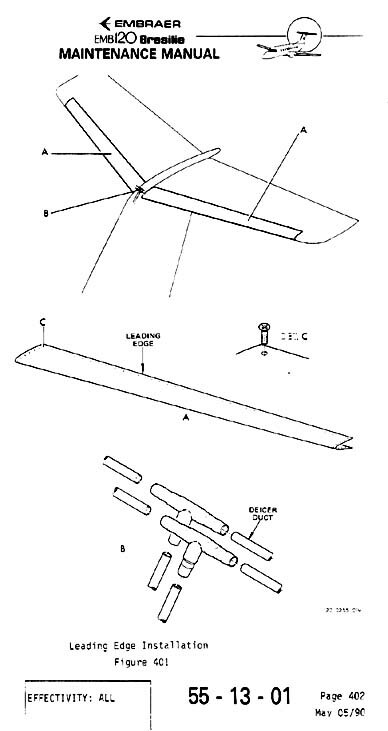 They were used to reconstitute the aircraft's trajectory (see appendix 3), which was used to define the search area for the missing leading edge. At the estimated time of the event, the pressure height was 3 600 feet (2 240 feet AAL), the indicated airspeed was 156 kt, flaps were retracted, pitch attitude was around +6°, roll attitude was 17° to the left and the magnetic bearing was passing through 215° on a left turn. Subsequently, the aircraft climbed to 4 000 feet and the indicated airspeed increased up to 198 kt. Readout of the CVR indicated a thump followed by a modification of the background noise (vibrations). There were no specific warnings. We note that the pilot flying suddenly felt vibrations in the control column and he wondered about a possible strike of some kind. He asked the other pilot to take over the controls. They immediately decided to return and land. They were never able to specify the exact nature of the problem encountered (see appendix 4). The left leading edge of the horizontal stabilizer was torn off all the way along and the outer part of the stabilizer was torn. The deicer system duct was disconnected but present.. Examination of these parts leads to the conclusion that the leading edge was torn off going from the inside towards the outside. 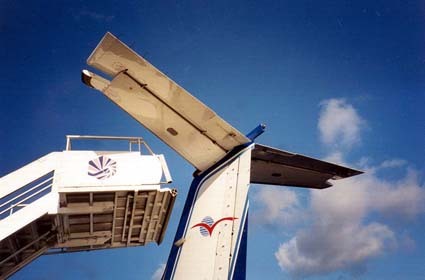 At the time of the accident, the aircraft had flown one hundred and fourteen hours and nineteen cycles since the approval for return to service on 10 September 1998. It was not possible to examine the leading edge, which was not found. Twenty-five screws from the upper surface were still present on the aircraft but they were unscrewed (see appendix 5). None of the screws from the lower surface were found. The BEA thus had forty-one retaining nuts from the upper surface and twenty-five of the associated screws as well as forty-one retaining nuts from the lower surface (see appendix 6). - another screw, without P/N, was oxydated, had a thread to the screwhead and was about 1.6 mm shorter than the approved screws. - two screws had no fresh grease. After this examination, the manufacturer asked to have the parts made available to be able to examine them too. The examination report shows that, in addition to the preceding observations, the seven screws with no P/N's or centering cone were made of stainless steel and were not cadmium plated like the manufacturer's original screws. In addition, the grooves in the heads of these screws contained no marks which would have been left by a tool used for tightening. On 11 September 1991 an accident to an E-120 killed 14 in the United States. 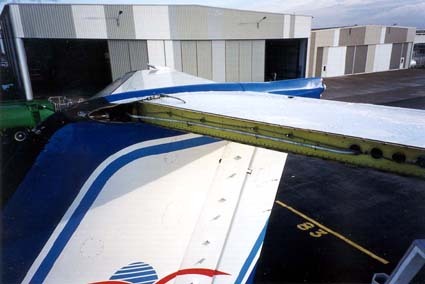 Descending through 11 800 feet, at an indicated airspeed of 260 kt, the left leading edge of the horizontal stabilizer broke away from the aircraft. An immediate dive resulted from this, and the aircraft broke up in flight. Work had been undertaken on the de-icing boots of the horizontal stabilizer the night before the accident. The investigation showed that the screws on the upper surface of the left leading edge had been removed but not replaced as a result of poor communications between two teams who relayed each to complete the work. Before the accident flight the aircraft had flown from Houston to Laredo. It was on the return leg at about sixty nautical miles west-southwest of Houston. 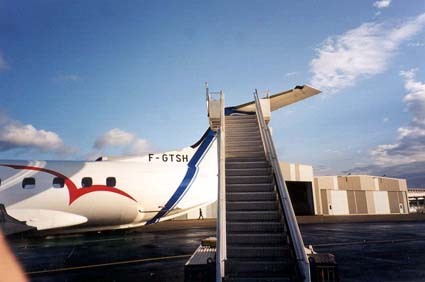 immediately after the incident involving F-GTSH, Regional Airlines asked Nantes Aero to check all the E-120's in the fleet for the presence of screws and their torque. It was noted that one or two screws of no significance were missing. 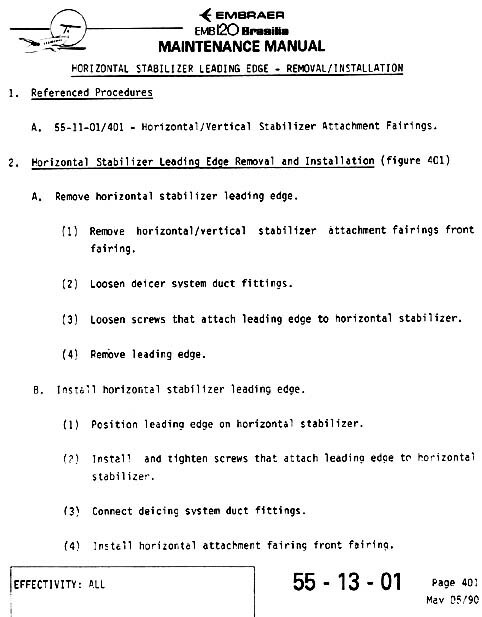 A technical data sheet was sent to all stations to ask them to check for the presence of screws under the lower part of the left and right leading edges of the horizontal stabilizer during each daily inspection. In the medium term, painting the heads of the screws was also considered so as to make it easier to detect any possible missing items from the ground. Embraer issued an Operational Bulletin N° 120-005/98 on 7 October 1998 to inform all Brasilia operators of the event and to ask them to pay particular attention during maintenance operations carried out on leading edges. This document also mentioned the 1991 accident. The replacement of the left de-icing boot on the leading edge of the horizontal stabilizer was performed by a JAR-145 approved maintenance workshop following the procedures laid down by the manufacturer. The work was carried out over several days and, although there was no change of team, there were necessarily interruptions in the work. It was established that certain screws did not correspond to the manufacturer's specifications and were in bad condition. These screws were, however, supplied by Nantes Aero S.A. or checked during the replacement of the de-icing boot. Examination of the screws found on the aircraft and of the retaining nuts leads one to think that the majority of the screws, both from the lower and the upper surfaces had only been partially tightened, perhaps only by hand for some of them. In addition, the manufacturer does not recommend the use of lubricant for installation of these screws and the majority of the screws examined had fresh grease on them. It is therefore likely that the screws loosened progressively which led to their loss until those which remained could no longer hold the leading edge in place. This is also coherent with the number of aircraft cycles performed by the aircraft before the loss of the part. In 1991 the complete absence of the lower screws meant it lasted only two flights. Note : When this type of event occurs, the crew is unable to understand what is happening or to appreciate the seriousness of the situation. The vibrations on the column on the pitch axis are the only manifestation which allow the crew to decide what action to take. In the case of F-GTSH, the return to the aerodrome was simplified by the fact that the crew was flying in VMC, which allowed them to make a relatively short circuit. The relatively low speed maintained also limited the seriousness of the event. - The aircraft was certified in accordance with the regulations in force. - The crew possessed the requisite licenses, certificates and ratings to carry out the flight. - The aircraft lost the left leading edge of the horizontal stabilizer shortly after takeoff from Clermont-Ferrand. - The crew kept control of the aircraft and requested a priority landing. - Removal and re-installation of the leading edge had been carried out in order to replace the de-icing boot. - The work had been carried out in a JAR 145 approved workshop. - The approval to return to service after this work had been issued on 10 September 1999. - The aircraft had flown one hundred and fourteen hours and one hundred nineteen cycles since the work on the leading edge. - The part which was detached from the aircraft was not found. - No screws from the lower surface were found. - Twenty-five screws from the upper surface were still present. The incident resulted from incomplete and poorly performed maintenance work which was not detected during the ground check before approval for return to service. The fact that the daily inspection of the tail is not easy to carry out was a contributory factor. Thus, the progressive disappearance of the attaching screws was not noticed during the nineteen days of operation which preceded the incident. Derrière le jetstream oui, vous avez une clairance pour moi ? Alpha Kilo le vent est strictement calme, autorisé à l'atterrissage. D'accord donc demi-tour et premier taxiway droite, vous rappelez piste dégagée. Oui tu peux faire demi-tour sur le sur le gazon, tu pénètres pas sur la piste j'ai une séquence de décollage. Clermont Sol de Sécurité Alpha on est au parking Alpha pour attendre l'avion. Oui Alpha Kilo, pour les Sécurités je pense qu'il y'a pas de problème là, on est tranquille, on est par terre, on roule euh ... à l'aise. Alpha Kilo on arrive au bloc, eh ben j'espère à tout à l'heure. Ok on y va avec le gros comme ça on verra on mettra tout l'éclairage on va suivre la piste. Ben oui donc j'ai le Flyco qui va partir t'aura qu'à le suivre derrière. The following is a transcript of elements which were comprehensible, at the time of the preparation of the present report, on the cockpit voice recorder. This transcript contains conversations between crew members, radiotelephonic messages between the crew and Air Traffic Control services and various noises corresponding, for example, to the use of controls or to the alarms. The reader's attention is drawn to the fact that the recording and transcription of the CVR are only a partial reflection of events and of the atmosphere in the cockpit. Consequently, the utmost care is required in the interpretation of this document. Communications recorded on the CVR which concern other aircraft are not transcribed. (...) : Words or groups of words which, at the time they were spoken neither interfered with the normal conduct of the flight nor add any elements useful for the analysis or understanding of this event. ( ) : Doubtful words or groups of words or those which required specific listening or study. All times in this report are UTC, except where otherwise specified. Two hours should be added to express local official time in metropolitan France on the day of the incident.